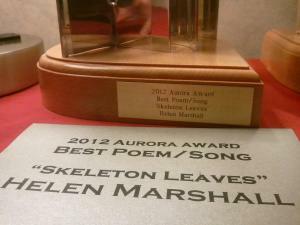 I’m very pleased to announce that on Saturday at When Words Collide in Calgary my poetry chapbook Skeleton Leaves won the 2012 Aurora Award for Best Poem! 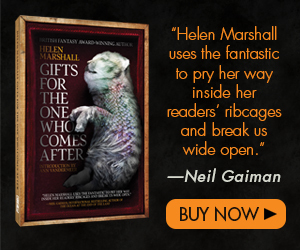 You can find out more about how to buy me me at http://skeleton-leaves.net! Unfortunately I wasn’t able to be at the event, but from the influx of tweets, texts, and Facebook posts, I’m tremendous gratified at the response! I’ve been calling this the Little Poetry Book that Could because as anyone who writes poetry knows, it’s a tough sell. It’s a tough sell to get someone to read a poem. It’s a tough sell to get someone to pick up a poetry book. 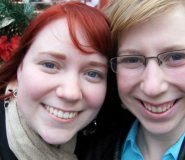 It’s an even tougher sell to get someone to buy that book (as I was reminded last Wednesday at the Chiaroscuro Reading Series by my fellow nominee Carolyn Clink’s reminiscences about her experiences at small press book fairs). So I want to thank all of you who did read the poem, or pick up the book, or even buy the book! Your support has been tremendous. Particularly because I do genuinely, deeply, passionately and without remorse, love this little book. 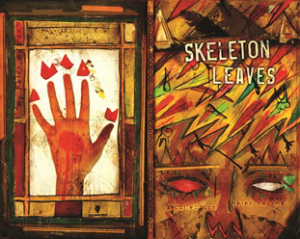 I wrote the bones of Skeleton Leaves between midnight and four AM on Christmas eve when I realized I didn’t have a very good Christmas gift for my mother. This has since taught me that plenty of good deeds are punishable and plenty of bad deeds are rewarded. So…thank you so much for this award. 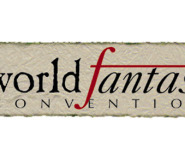 I’m truly touch by the generosity and support of the Canadian speculative fiction writing community. I’d like to congratulate my fellow nominees on their extra work, and I’d like to offer especial thanks and praise to Laura who keeps me fed, Chris Roberts whose artwork made this poem come alive and to Sandra Kasturi, my friend, mentor, and editor, without whom these would still just be words on a computer screen. Oh, right, at the pit of spikes comment? Anyone who has seen an Aurora Award would understand. They are death traps. 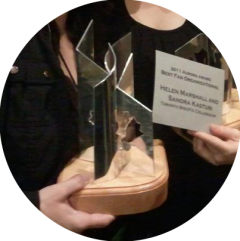 So you can see what it looks like, here is the Aurora Award Sandra and I won in 2011 for Best Fan Organizational for the Toronto SpecFic Colloquium. Note the points. Wait for it…one more picture! But this time of the real thing! Courtesy of Brett Savory and his phone. Congrats, Helen. That’s a heck of an accomplishment!